Vehicles move through morning smog on the last day of a two-week experiment to reduce the number of cars to fight pollution in New Delhi, India, Jan. 15, 2016. 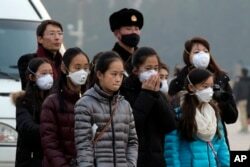 "Air pollution is the fourth highest risk factor for death globally and by far the leading environmental risk factor for disease," University of British Columbia professor Michael Brauer said Friday. "Reducing air pollution is an incredibly efficient way to improve the health of a population." FILE - Young tourists wear masks as they stand near a Chinese Paramilitary policeman in Tiananmen Square in Beijing, China, Dec. 19, 2015. The latest research on air pollution was presented at the conference of there American Association for the Advancement of Science in Washington.